Home Beers Brouwerij Van Honsebrouck N.V.
Kasteel Barista Chocolate Quad Belgian Ale | Brouwerij Van Honsebrouck N.V.
Sweet and spicy. I am not disappointed! Bottle: You'll need all senses to get the most out of this beer, sour aroma, pitch dark, dark chocolate taste. Very complex. Pours a deep dark-brown color with a medium top of beige head that dissolves rapidly. Aroma is of milk-chocolate, tofee, coffee, vanilla, caramel, raisins and bread. Almost cake like. The taste follows the nose with sweet and malty roasted tones in the flavour. The chocolate, coffee, caramel ect. lays strong in the background. The finish has a slight bitterness mixed with the roasted feel in the back and leaves a long aftertaste. It,s kind of a strange flavour combination in a quad, but it works very good. Mouthfeel is creamy,silky and smooth with a medium carbonation and a medium body. A very nice and enjoyable example of a quadruple. Got at Total Wine in University Park, FL. I was looking for La Trappe Quad and they were sold out so they recommended this one. Never had a chocolate quad before. Smell of cocoa nibs. Feel is nice with a little bite from the alcohol. Taste up front is a little tart with plum and dark fruit and on the back end is the chocolate. Cuerpo medio y carbonatación baja. Aroma tostado, con un poco de caramelo y café. En boca se siente un poco de toffee pero a la vez frutos secos que dejan una sensación amarga y poco agradable. My initial impression was that this was more of a caramel stout/porter (albeit a lovely one) than a Belgian Quad... but the non-immediately-obvious Belgian underpinnings do seem to provide greater drinkability compared to a similar ABV American-style stout. It wasn't what I expected based on the label, but I'd call it a good surprise. If you don't like caramel-forward beers your mileage may vary. It's good but a bit confusing, it does not taste like a Belgian and with the chocolate/coffee flavor it's like trying to be a stout but it isn't. Still tasty, just it's odd. Don't enjoy the smell or the after taste personally. As a lover of chocolate I was really hoping to love this, but I just didn't. Looks nice and smells nice but honestly one of the worst tasting beers i've ever had. Would never drink it again, even if free. 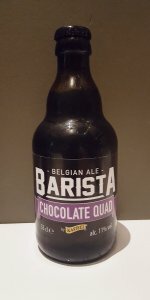 Tried Kasteel Barista Chocolate Quad for first time after a huge meal meatball sandwich and inferno chicken wings. This 8oz Belgian Chocolate Ale was the perfect compliment to the meal , better than Belgian Chocolate cake for dessert. It is a five star Ale with a great combination of chocolate flavor intruced to to the Belgian Ale. Kasteel Barista Chocolate Quad Belgian Ale from Brouwerij Van Honsebrouck N.V.